Traditional approaches to the law of estates in land and future interests often frustrate students by presenting topics in a disjointed sequence, spending inordinate time on dated concepts, and delaying coverage of the most daunting subtopic, the Rule against Perpetuities, until late, when students are experiencing sensory overload. 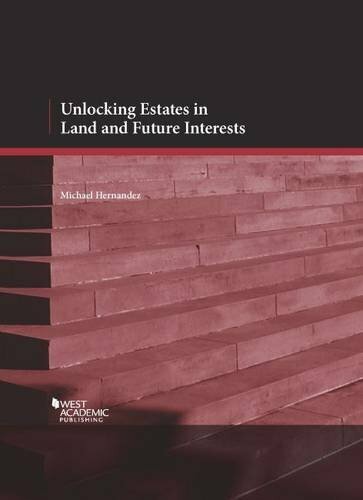 Authored by a professor who has taught Property for over two decades, this unique workbook, which has received overwhelmingly positive student reviews, furthers comprehension and mastery by presenting the material in a logical sequence and providing thorough and clear explanations of the concepts. Each chapter includes review problems, with answers provided, and class discussion problems. A comprehensive Teacher’s Manual provides detailed explanations of the class discussion problems, Power Point slides for class use, and guidance for covering the material. This workbook will enlighten and challenge students and professors alike and can be used to complement any textbook or as a study aid.